With the PlayStation Classic already available, and the Sega Genesis Mini due in September, 2019 is a cracking time to get into, and enjoy, retro gaming. Of course, an even better way to experience classics is via remasters, and two of the best are discounted right now. You can pick up Spyro Remastered for $30 at Walmart in the US, and for £20 at Amazon in the UK - both saving you about 25% off the list price. And Crash Bandicoot N.Sane Trilogy is $33 at Walmart, and £21 at Amazon. This is for both PS4 and Xbox One - you'll find all the deals below. If you're looking for Crash on Switch, the cheapest we've found that was $31 at Amazon. 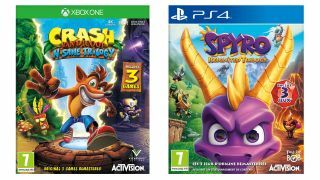 If you're feeling especially nostalgic, you can get both Crash and Spyro in a mega-bundle for $60, which saves you even more cash. Both these games are trilogies, so you get a hell of a lot of retro for your money. If we had to pick, we'd definitely go for Spyro as the revamped gameplay is much more suited to modern consoles, and it's a little less frustrating for players. Obviously, if you own Switch, you don't have much choice as it has to be Crash, but that game does play well with Nintendo's console. Of course, you may not like any of these games. If so, check out our best retro games console guide, to help you choose something else to help you scratch that old school gaming itch.